Hi, everyone. I have a little problem that nobody seems to know what to do with. 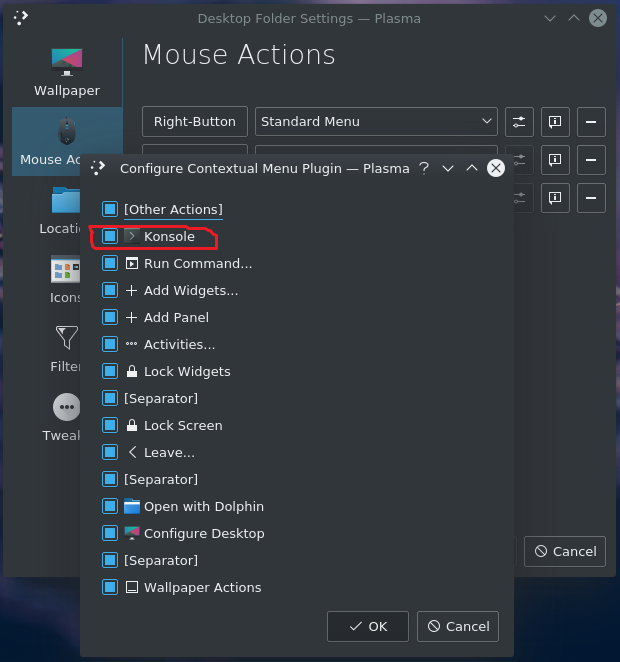 It seems that in Fedora specifically, KDE has "Konsole" baked into it's desktop menu. So the problem is, I don't really use Konsole, in fact, it's not even installed on my system. I prefer Tilix or st, so for me this button literally does nothing. And I would very much like having a terminal that I use in this menu. But it seems that I can't find a way to add/remove from this menu. Can you guys help me? Am I just unable to find the right .desktop file? In the past, this part was hardcoded, but that was a long time ago, and a developer in 2008 told that it should be able to read settings from a config file in future builds. Well in Fedora 29, I went to "Applications/System" and right clicked on the konsole icon and selected "Edit application". The properties window pops up and I clicked on "File Type Options", a big button in the middle, another pop-up shows up called "Edit File Type application/x-desktop--File Type Editor? ", I highlighted "*.kdelnk" and selected "-Remove" then "Apply", and damnnnnn! it was gone from the menu, who would'ave thunk it?. Then I clicked the "+Add" and typed "*.kdelnk", then "Apply" and holy smokes! it's back. But don't close both pop-up windows, just the Editor (second one), in the properties window (first one that appeared), click the Applications tab, in the "Name" field exchange Konsole for Tilix, to the right of the "Command" field click on "Browse..." button and browse to the Tilix executable and select it. There's nothing in the "Work path" field, probably don't need anything either. Back on the "General" tab, click on the icon and you might find a different icon you might like better, permissions are my user name for both user and group. As for adding a new one for st, heck, you're on your own there bud, I'm tired. If it were me, I'd add the programs I use to my "Favorites" list and leave the main part of the menu alone because I'm lazy. I went to "Applications/System" and right clicked on the konsole icon and selected "Edit application". Excuse me, I seem to have difficulty accessing "Applications/System". I am presuming you are not talking about "System Settings"? Could you be a little more specific, please? There's a blue "F" bottom left corner to bring up the applications menu, click on it, slide the mouse at the bottom to "Applications", now it says on top "All applications" with 11 categories starting from Administration down to Help Center, second from the bottom is "System", in that category is where the "main" Konsole launcher that I right clicked on to make the changes. That's problematic, I don't have Konsole. Should I install it then? Preform the actions and then uninstall? Also, when I bring up the menu from the blue "F", it defaults to "Favorites", under the 6 apps I have in favorites, I right click in empty space and select "Edit Applications". This brings up the "KDE Menu Editor", in this editor you can edit any of the existing shortcuts currently in the menu. Also, you can create a new entry, so if you want to add an entry for "ST", and want it in the System category where the Konsole shortcut is by default, click on the arrow to the left of "System" to show all other current shortcuts and at the top of the window click on "New Item", It'll ask to enter the item's name where you would enter "ST" then click OK and a new shortcut called ST will appear in System category. If it shows up in another category, left click and hold to drag and drop it in your preferred category. You can drag and drop any current shortcut wherever you want them in this editor. With the new entry called "ST" highlighted, on the right side, select desired icon, description and Command where again you would browse to the executable for ST.
No need to install it, if it's shortcut is there, you can edit it to make it a shortcut for one of your other apps or delete it from the KDE Menu Editor mentioned in my previous post. I am well aware of that. St creates an entry there by default, so is Tilix. But Application Launcher is not an issue. I have a problem with context menu on desktop (the right click on an empty space, where "Create New", "Icons", "Refresh Desktop" and such). The KDE menu editor is what you were originally looking for, you can do whatever changes you want to the menu from here. I got some sleep, so took the time to figure it out for ya. That's odd, I don't have Konsole baked into the desktop in my Fedora. None the less, from the Konsole shortcut in the main menu where in my first post I mentioned removing *.kdelnk, there's also a *.desktop entry you can remove, maybe that's what you're after. To me it appears that KDE menu editor only edits entries in Application Launcher/Application Menu. Is that wrong? The app I want to configure is "Standard Menu". Nope, tried that too. How come you don't have "Konsole" entry? I've installed mine from netinstall-1.2.